"Intelligent, sensitive, loyal, devoted and affectionate." Artwork by Sheryl Getman left: Rinchen boy "Picasso", right: Rinchen girl "MiMo"
Tibetan Terriers are in fact, NOT a terrier breed, but guard and nomadic herding dogs from the "roof of the world", Tibet, and are considered to be one of the the most ancient pure breeds of dogs. They were bred and raised in monasteries by lamas almost 2,000 years ago. As the "Holy Dogs of Tibet," the breed was treasured by the lamas, who kept them as companions, good luck charms, mascots and watchdogs. They were also used for nomadic herding and to retrieve articles that fell down the mountains. The breed is exceptionally healthy and long-lived. They are highly intelligent, sensitive to their owner's moods, loving and always busy independently thinking. Curling up by your side during rest time seems a must! They are watchful and alert without being noisy. They may be reserved with strangers but never forget their family members, even after an absence. The Tibetan Terrier responds best to positive, patient training and regular outdoor exercise throughout life. They have plenty of energy to romp and play, especially if their owner or a dog companion joins in the fun. Secure fencing, lots of exercise, mental stimulation and companionship will make for a very happy dog and family. In its natural state, the Tibetan Terrier is medium-sized (14" to 17" tall at the shoulder and 18 to 30 pounds), powerfully built and very agile, possessing large, flat, round feet. The breed has a protective double coat, which can be any color or combination of colors, and a fall of hair over the eyes. The long-haired, weather-resistant double coat does not shed but does require weekly grooming. Companion dogs are often kept in either a short or mid-length haircut. The breed tends to be acceptable to those individuals allergic to dog hair. (see our 'links page" for more information on this topic). 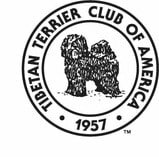 For those interested in showing a Tibetan Terrier, please see our page outlining AKC Tibetan Terrier Breed Standards.